French Bread Pizza. It’s quick and easy, and everything you want from pizza! I especially recommend making your own pizza sauce with our thick and rich easy recipe! I’m pretty sure that, just as I could eat tacos for any meal and everyday, my husband could eat pizza for any meal and everyday. So, you can imagine that we eat pizza pretty often around here. We have our favorite Homemade Thin Crust Pizza. But, it does take a while to make. So, if I want something quick, we’ll do this French Bread Pizza. It’s quick and easy, and gives you everything you want from pizza. Before Cooking: My veggie pizza on the left with thinly sliced red onions, chopped green onion, and Italian Herbs. Dan’s pepperoni pizza on the right. I also like that we can customize our French Bread Pizza – Dan’s with pepperoni, and mine with veggies of some sort. We usually eat 1/4 of the loaf of French bread for dinner or lunch. Now, if you have more people or bigger eaters, feel to double this and get 4 pizzas. Just rotate the pizzas in the oven halfway through cooking if you have all 4 halves in there at once. Slicing: be sure to use a serrated knife to cut the pizzas. And, I always have Dan cut mine first so that I don’t get pepperoni juices on mine. **Store-bought Italian Herbs will work just fine, but I like to make my own Italian Herb blend. It’s easy and I just fill a jar to last us a nice long time. Cut the French bread in half, lengthwise, and put the halves, cut side up, on a cookie sheet. Spread ½ of the pizza sauce on each side. Sprinkle with cheese. Put your favorite toppings on top, and sprinkle with Italian herbs. Bake for 5-7 minutes, or until the cheese is melted starting to brown. Cut into loaves into wide strips. Enjoy immediately. Super easy to make, and the best pizza sauce I've ever had. You'll never go back to jarred stuff after trying this. Mix all ingredients together in a medium mixing bowl, and refrigerate at least one hour before using. I like to make my own Italian Herb blend. It’s easy and I just fill a jar to last us a nice long time. Mix well, and store in an air-tight container. Double or triple as needed. 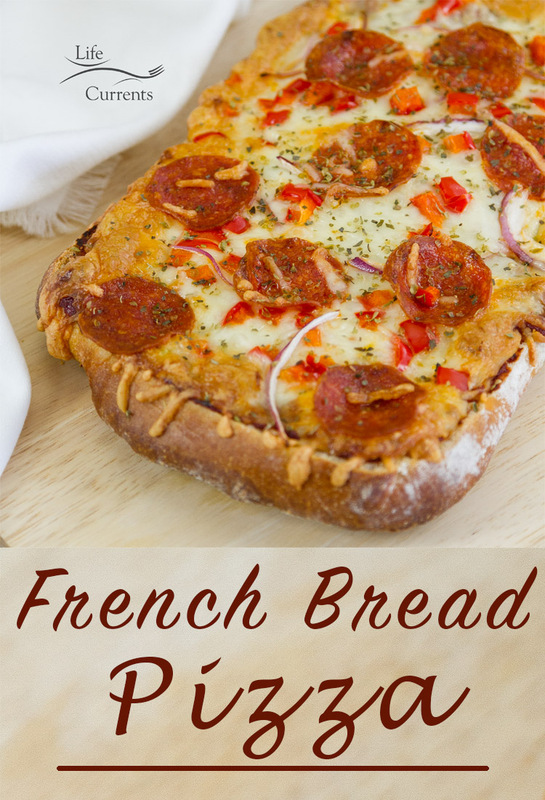 Thanks for sharing your French Bread Pizzas at Foodie Friends Friday Pizza Linky Party!